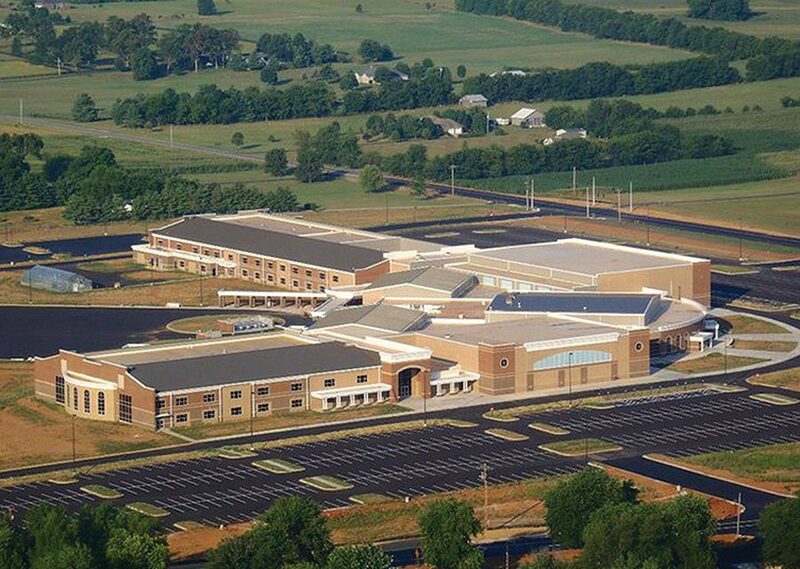 South Warren Middle and High School is the largest school in Kentucky and also one of the most efficient. 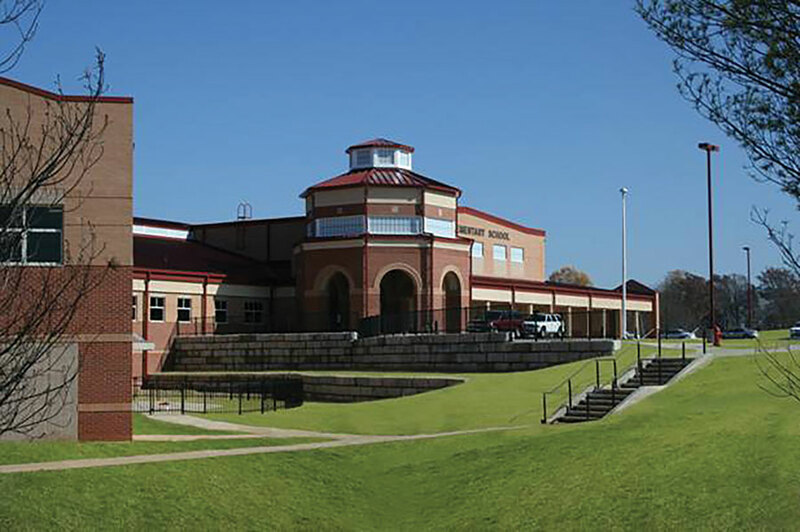 South Warren Middle and High School is the largest K-12 School Building in Kentucky. It combines a 1,250-student high school and a 750-student middle school under one roof–essentially two schools “joined at the hip,” with a shared auditorium complex and centralized kitchen. The facility contains over 332,000 sq. ft. on two floors constructed on an 85-acre site. The building is considered “net zero ready” due to its extraordinary low energy use, operating at only 24.3 EUI (energy use intensity), and for its size, is one of the most energy efficient schools in the nation. During the design phase, the Warren County Board of Education specified several goals for the design of this new school: energy efficiency, speed of construction, student safety, and “green” design principles. To accomplish these goals, Sherman Carter Barnhart chose to utilize Insulated Concrete Form (ICF) for the building structure, knowing ICF’s could achieve all the owner’s goals in one building system. The Warren County Board of Education and Sherman Carter Barnhart Architects had significant experience together with ICF construction, beginning with the design of Alvaton Elementary School, the first ICF school facility in Kentucky. In 2005, the average energy consumption for a similar school was 76 EUI. The year it opened, Alvaton’s energy consumption was cut in half, operating at only 36 EUI, with ICF construction being the only significant design change. In 2008, Warren County hired Sherman Carter Barnhart to design Plano Elementary, and with changes to the geothermal system and kitchen equipment, the resulting energy performance was reduced to 28 EUI. Barnhart Architects and are all ICF buildings. First and foremost, “net zero ready” design is a subtraction or “diet” problem to solve. During the design of South Warren Middle and High School, the design team had to re-think every decision, and asked “How does this strategy affect energy consumption?” It’s important to note that the average school today will consume more than 73 EUI per sq. ft. per year in climate zone four. 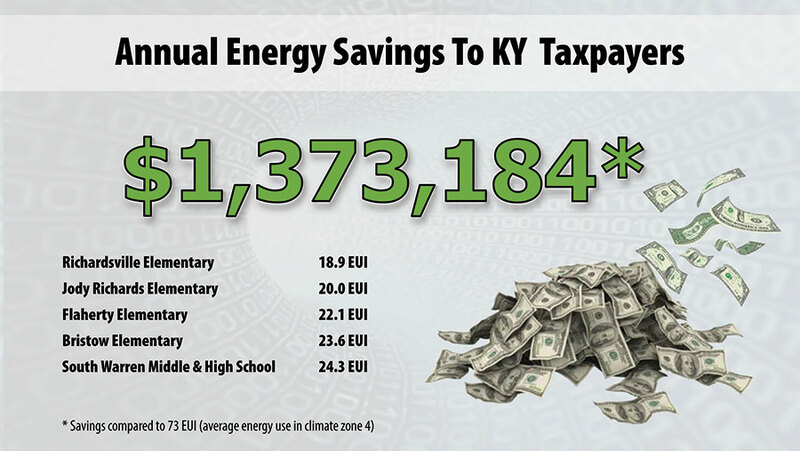 South Warren Middle and High School operates at only 24.3 EUI, which equates to a 70% reduction in energy use. Alvaton Elementary was first ICF school in Kentucky. Completed in 2005, it uses half the energy of similar schools, with ICF walls being the only significant design change. With a building “diet” strategy, the design team identified targets for potential energy reduction, such as a high performance geothermal system, improved building envelope, and daylight harvesting to name a few. But in terms of a critical path for these decisions, the building envelope kept rising to the top of the list. 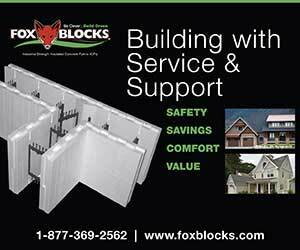 Past experience with ICF buildings had proven that ICF construction significantly affected energy performance. The strategy would, however, need to be two-fold: First, design the building to be more compact in plan and volume. 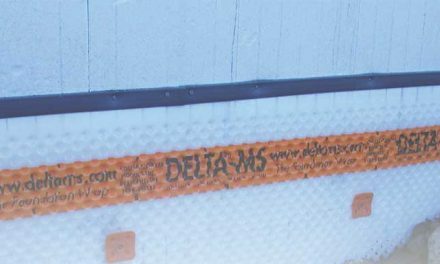 Second, choose products/systems that would substantially increase the insulating value/air tightness/thermal mass of the envelope. 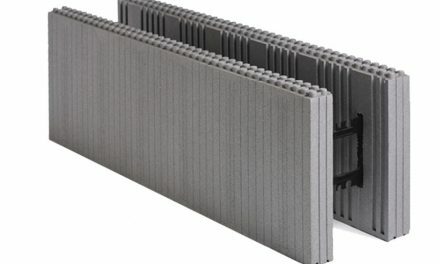 Ultimately, Sherman Carter Barnhart chose ICF for the wall system, and increased the R-value of the roof to an R-32 with 6” of polyisocyanurate rigid insulation. The ICF manufacturer provided 8” and 12” ICF forms for the entire wall system (interior and exterior), and Sherman Carter Barnhart then optimized the system with a simple design that significantly reduced the building’s perimeter wall area. The resulting plan, oriented for proper solar exposure, reduced both construction costs and operating costs with an HVAC system requiring significantly less load. The design decisions go well beyond choosing a material with a high R-value, though, thermal mass plays an incredibly important role in reducing energy consumption. 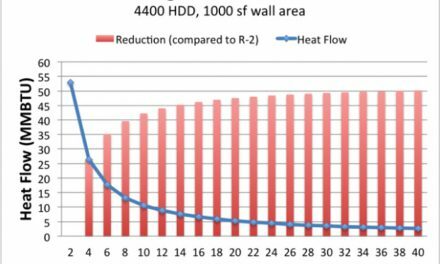 While the high R-value of ICF’s resist internal temperature change, the high mass of the concrete wall system absorbs energy and stores it. This is critical in any climate where daytime temperatures fluctuate from nighttime temperatures. In the case of South Warren Middle and High, as well as Sherman Carter Barnhart’s other ICF designs, night temperatures in Kentucky are less than daytime, and the stored energy gathered during the day is slowly released at night when the building is unoccupied, helping to resist a temperature “fall off” that must be corrected during operating hours. Bringing the temperature back up in the morning takes far less energy than traditionally built schools, thanks to the thermal mass of the ICF system. This, in turn, allowed the design team to design a smaller capacity geothermal HVAC system, which also reduced energy consumption. There really are only a couple of ideas to reduce energy that offer large reductions. When you get beyond ICF and geothermal systems–the building envelope and HVAC, the design decisions to reduce energy further become smaller and more numerous. You go from making a couple of big decisions to making hundreds of smaller ones. This was one of the big challenges–taking a hard look at every aspect of the building that potentially uses energy, even to the point of deciding whether or not the teachers are allowed to plug in personal microwaves in their classrooms. The project timeline presented a critical path of 18 months for construction, which would include two Kentucky “winters.” At the time South Warren was bid, ICF construction cost less per square foot than traditional masonry, so the design team utilized ICF for both interior and exterior load bearing walls. Because the concrete is protected and insulated as it is placed and cured, the winter weather played less of an issue in the ICF construction. This, in turn, allowed the construction to speed up, and all walls were built to “bearing” at the same time, ready for the hollow core concrete planks to be installed throughout the building at multiple locations. South Warren Middle and High School also provides students a safer building during severe weather, with storms and tornadic activity common during Kentucky’s spring and summer seasons. 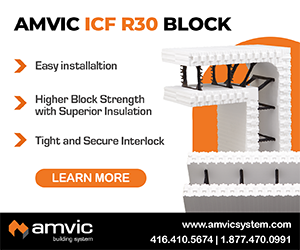 The inherent strength of the ICF wall system, coupled with the hollow core concrete plank floor system, creates a building structure capable of resisting 250 mph winds. By using ICF’s and taking advantage of design decisions to maximize the performance of the wall system, the design team delivered a facility capable of achieving net zero with the addition of future solar panels. But the real-time savings come from reducing energy and saving dollars that can now be used for student achievement in the classroom rather than utility bills. 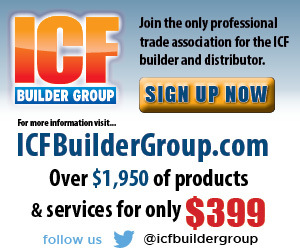 With ICF construction, there is not just one advantage, there are multiple advantages. Based on Sherman Carter Barnhart’s experience, it would be hard to see a better alternative. In the true spirit of green design, the South Warren Middle and High School project saves resources and operating costs, all while providing an optimum learning environment for its students. 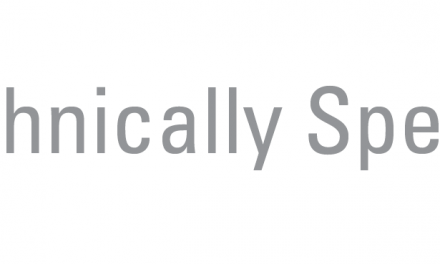 Kenneth W. Stanfield, AIA, LEED AP is a principal at Sherman Carter Barnhart Architects, one of North America’s leading architectural design firms.